The most important and influential stakeholders for biosimilar acceptance and usage are physicians and patients. However, there is evidence of significant gaps in knowledge for both audiences. The majority of cancer biologics are administered in an outpatient setting and paid for under the medical rather than pharmacy benefit (Part B for Medicare). Medicare typically reimburses for medication administered in a physician office or infusion clinic at a rate of the average sales price (ASP) plus 6% as an administrative fee.28 To incentivize the prescribing of biosimilars, CMS set the administrative fee for the biosimilar based on the ASP of the reference product plus 6% of the reference product’s ASP. How individual states will handle reimbursement under their Medicaid programs remains to be seen.29 Moreover, in January 2018, CMS finalized a ruling on the hospital outpatient prospective payment system (OPPS) for 340b hospitals, adjusting reimbursement to ASP minus 22.5%.30 This may impact the utilization of biosimilars in the ambulatory setting. 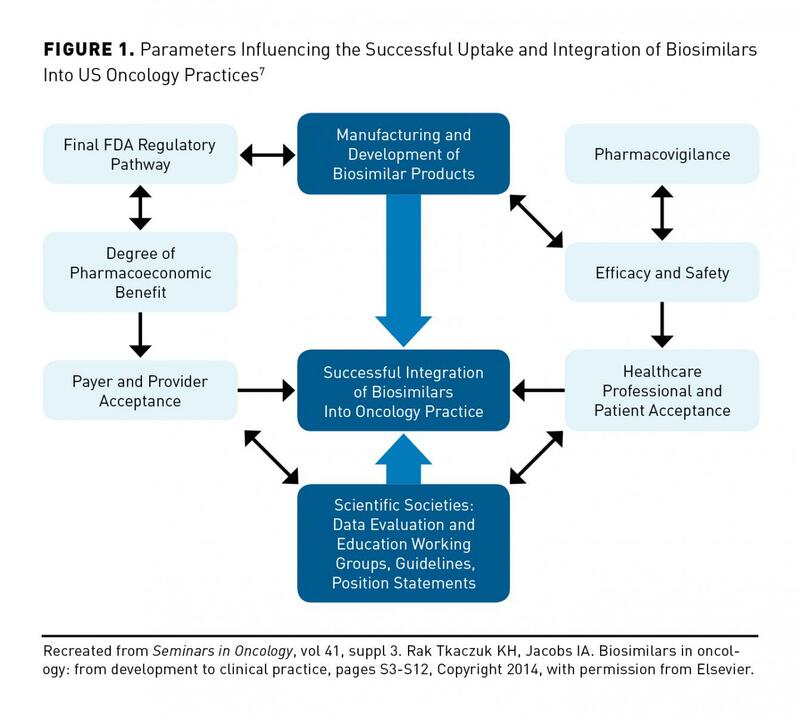 In the acute-care setting, biosimilars can be incorporated through the pharmacy and therapeutics (P&T) committee within the institution. This committee is primarily responsible for approving the pharmacy formulary system for the hospital and includes pharmacists, physicians, hospital administrators, nurses, and additional staff who support the medication use process. Many factors are taken into consideration when reviewing a drug to be placed on the formulary, including clinical effectiveness, operational objectives, cost, and product supply chain. Policies and procedures are approved that can include automatic substitution for medications to match the hospital formulary. Furthermore, the P&T committee can assist and direct staff educational programs that reflect changes to the formulary. 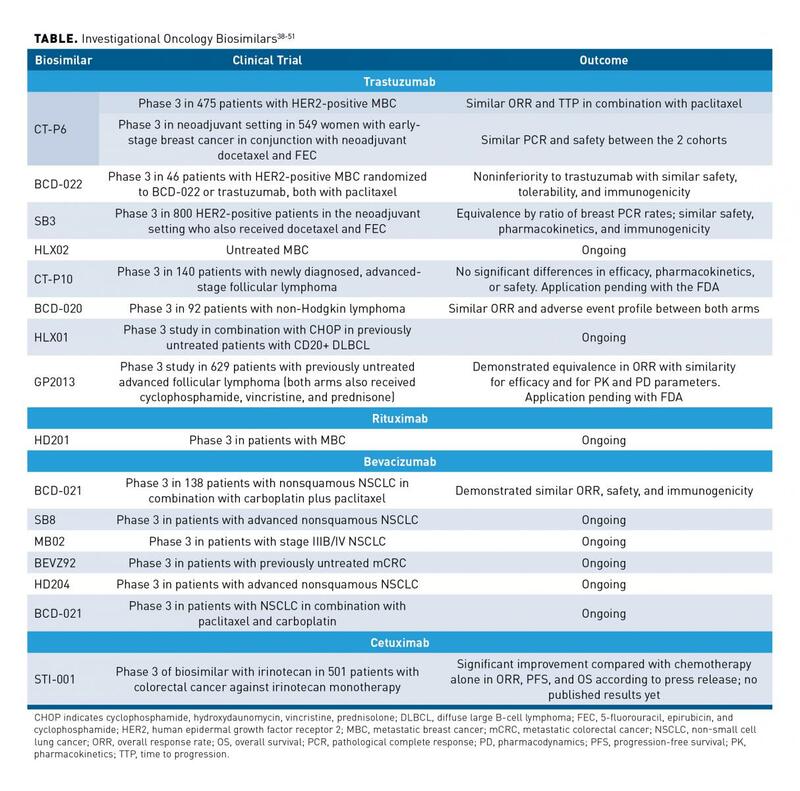 Several oncologic biosimilars to trastuzumab, rituximab, cetuximab, and bevacizumab are in late-stage clinical trials (Table38-51). As more patents begin to expire on oncologic biologics, the pace of biosimilar development in this therapeutic arena will pick up speed. At least 16 biosimilars are now in late-stage development and 2 are already approved (albeit not on the market as of March 2018). Their uptake in the oncology community, however, remains unclear. 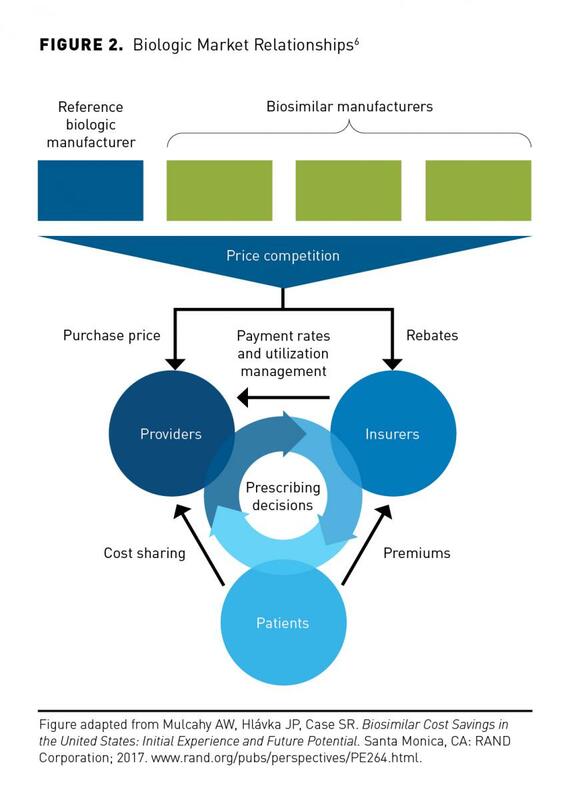 Challenges include physician and patient understanding of biosimilars versus biologics, particularly in terms of approval process; concerns over immunogenicity; pricing; interchangeability and substitution; cost; and supply chain issues. The option biosimilars offer, even at a 15% discount, will likely overcome these barriers as they move into the market and offer some promise for future treatments.